My baseball career had ended and I was starting a new career in business and struggling with what I really wanted to do with the rest of my life. That is when I met Dan Hettinger. He was starting a church in Gwinnett County, Georgia. Right away, I saw that Dan and I had a couple of things in common. One was our belief in Jesus Christ as Our Lord and Savior and the other, our love of baseball. I knew the game of baseball pretty well. I didn’t know the Lord’s game very well. I was looking to grow in my knowledge of the Bible so Dan and I started a Men’s Bible Study shortly after we met. We also invested about a year in 1 to 1 Discipleship in his office or at Waffle House early one morning a week. I shared a lot of baseball stories with Dan over the years. Good ones and not so good ones. 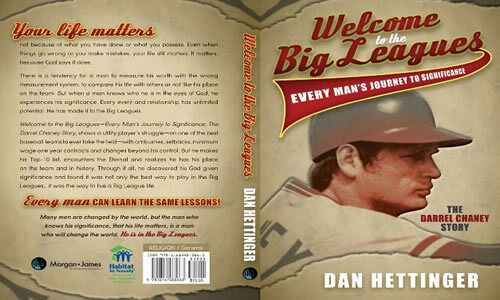 As time went by, Dan kept telling me he was going to write a book of encouragement based on my life and experiences in baseball. So, we put it on our prayer list. I kept telling Dan we had a couple of things going against us. Dan was an unknown writer and I was a “not so famous, old ballplayer” that many people may not remember since my career wasn’t one for the record books. Dan kept saying, “If the Lords want this book to be written, He’ll take care of it.” So He did and this is my story. But being in the middle does not mean mediocre. I always wanted to be the best and I dreamed big, trained hard and competed intensely and I made it to the Big Leagues—even the World Series three times! Every man wants success, dignity and respect--to make it to the Big Leagues or to the top of his profession. He wants to be significant. Dan said that there is often a difference between those who inspire and those who encourage. Inspiration comes from the stars in position of strength and success. Encouragement comes from those who are defined by struggle and empathy. I believe the latter best describes my life. Through this book project, I’ve come to realize in a deeper way that, even though I was not the most famous baseball player, my career and my life mattered to God. I was significant for who I was and when I lived that way, my life made an impact. Now I want to be an encourager for those who know me and hear me speak or read about my life. I want others to discover their God given significance. I pray that reading this book will encourage you as much as working on it with Dan, has given me a clearer belief in my God give significance. Richard B., Worship Leader & sports geek. Carl K., Chemist, cancer and heart attack survivor and Giants fan—even before they called San Francisco “home”. Bob D., retired Golf Pro. Doug B., Wealth Advisor, Rockies fan and Little League coach. Steve M., Aero Space Process Consultant, aka Rocket Scientist, and life-long Dodgers fan.